Being a vlogger myself, naturally I like to watch a lot of other vloggers in my spare time. I want this post to be truthful, so I’m not going to search out random vlogmas’/daily vlogs just to fill space on this post. In fact, I probably watch a lot of the same Youtubers as you do! However there are a few smallers ones that I have found recently, who I do enjoy. So without further explanation, let’s crack on! In no paticular order, here are the Vlogmas’/Daily vloggers I’m watching this year, without fail. He makes claims that he’s not a daily vlogger, when in fact, he is. Joe IS doing Vlogmas this year, even if he won’t admit it. Also needs no explanation. A reasonably small youtuber when compared to Zoella (94K subs), but we know numbers do not matter. She’s quite well-known for having worked at Gleam Futures (the management of Zoella etc) and is now signed by them herself. I love watching Katie as she’s so likeable and down-to-earth. Her chats with her mum are also hilarious. She has this amazing quirkiness and charm too; you should go check out her channel. Pointless Blog, A.K.A. Alfie Deyes, boyfriend of Zoella. 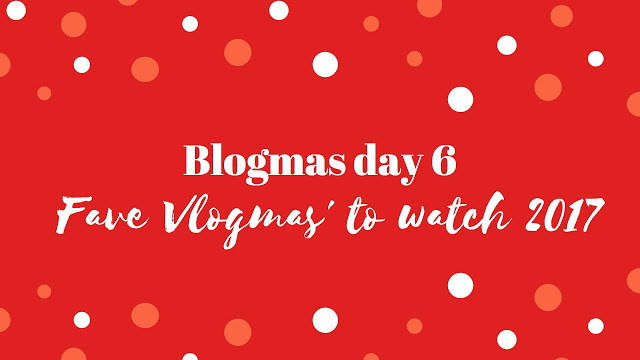 A daily vlogger for yeaaaaars, he’s automatically doing Vlogmas, but still worth a watch for any moments that Zoe doesn’t manage to capture! I also tend to watch his throughout the year, so it’s habit for me anyway. A small youtuber like myself, Seth lives in Denver, Colorado. I’ve only been watching him for a few days and I’m already slightly hooked. I’m assuming he’s a daily vlogger as I’ve seen him upload everyday so far. I think for me, the intrigue is American life. I love the USA and love watching how differently, or even similarly, life is lived over there. I also like his style of filming. Great for getting ideas for my own vlogs! A young family from Scotland, the Youngs are great to watch. A smallish channel (37K subs), they vlog mostly about being parents, looking after their two children, River and Cove. I just love how down-to-earth and ‘normal’ they are. I think when I start a family, I’ll be watching their vlogs all over again! Next to Zoella, I would say Rhiannon is my all-time favourite Youtuber to watch right now. I LOVE her non-intrusive style of filming; the documents her life with her boyfriend Doug and their sweet little daughter, Delilah. Her vlogs are super cosy and always cheer me up. She’s always aware of what she’s sharing to her viewers and is always conscious about ‘boasting’ about buying things, which makes her even more likeable (she shouldn’t be anyway!) Again, when I start a family, I’ll be watching her vlogs again. I often watch Fleur’s channel on and off, but always tune in to her Christmas Gift Guide videos (especially the ‘him’ one she does with her Husband, Mike – I find him rather funny! )I’ve started to realise though that I prefer Fleur’s vlogs. Despite her big channel, she’s so normal and not boast-y. Fleur and Mike have a few dogs and cats, who are all super cute (another reason I love watching). I also think I find Mike to be quite similar to Fabio, so I always end up laughing and showing Fabio parts of it. Recommend her vlogs if you’re not already a viewer! Despite being a channel that has grown rather quickly due to being Alfie Deye’s sister’s boyfriend (what a mouthful! ), his videos are good to watch! He’s got such a good sense of humour and is rather quirky. He’s big on his trainers, so these are often the focus of the vlogs! You’ll often catch him and Poppy on outings with Zoe an Alfie, so another chance to watch things from different angles! Poppy and Sean also have such a cute (but also funny!) relationship, which I love watching. And here are some other non-daily channels who I’m also watching a lot recently. Who do you watch a lot of? Let me know in the comments!